Wedding dresses are so fun to try on, especially when the dresses you’re trying on are ones you can actually afford. When I used to watch ‘Say Yes to the Dress’ on TLC, I was mortified about going dress shopping because some of those girls would pay $10,000 for a dress. Yikes! Luckily, dresses are actually much more affordable than that show makes it seem. 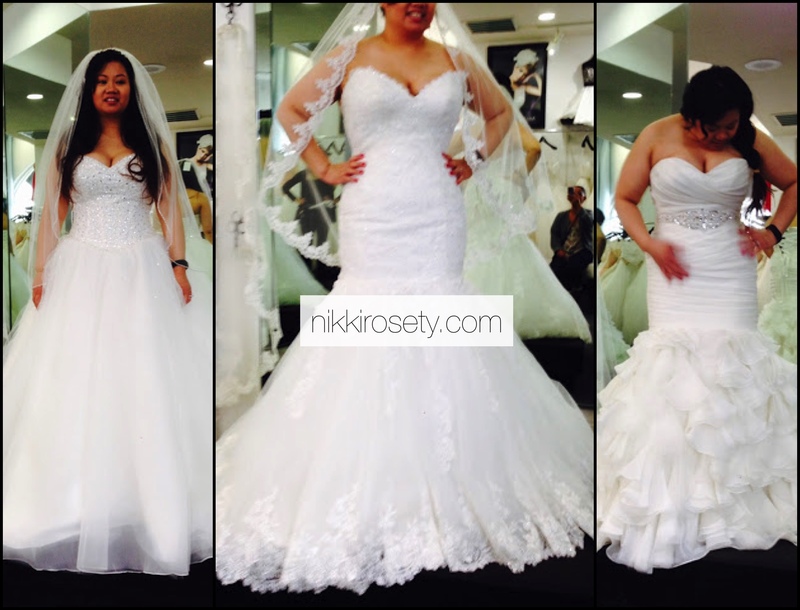 Here are 10 dresses I tried on at David’s Bridal and Celebrations Bridal. In order to find my wedding dress, I tried on less than 15 total dresses. Kind of crazy, right? I thought it would be a lot more. But, trust me, you will tire of trying on dresses and you will tire of dragging your family out to watch you try on dresses. Or, is that just me? Anyway, on to the rejects! For awhile, I thought I wanted a long-sleeved dress to hide my ginormous upper arms. I thought I would look sleek and classy. The long-sleeve dress I tried on didn’t fit (too small, as you can see), but it just made me feel old. So it was a no-go. The dress on right has some nice layering, but it felt as if it was made for a beach wedding. Plus, it didn’t feel like it had much support. Oh ballgowns… How I love thee. These two could have been poofier. (Is that a real word?) If you’re going to wear a ballgown, why not a huge one, right? The neckline on the dress on the left was unique and I liked that it hid my cleavage. The neckline on the dress on the right seemed tacky to me for some reason. Maybe it was those straps? This dress on the left does nothing for anyone’s shape. Unless you are ridiculously curvy – this dress won’t help at all. I felt like it held me in, but I felt like it didn’t add anything. The dress on the right was on top of my list before I went to Celebrations Bridal. Looking back now, I don’t know that I would’ve like how loud the ruffles are, but after trying this dress on, I knew I wanted the fitted waist all the way to my hips. You all have to excuse the faces I make when I tried on these dresses. I love lace, but these dresses just looked horrible on me! Plus, I hated the neckline on the dress on the right. This simple ballgown dress (on the left) felt like it had a nice fit. I would’ve added sleeves, but looking at it now, it looks boring. The dress on the right is like someone’s 90’s prom dress. The fabric felt cheap and I’m pretty sure it was cheap. Remember that alterations can do magic – like add sleeves! I purchased my Maggie Sottero bridal gown from Celebrations Bridal in Las Vegas. I was never actually going to go to Celebrations Bridal and was planning on just going to go to David’s Bridal and Alfred Angelo. I only decided to browse their selection because a David’s Bridal employee, who was also a bride, said she wasn’t going to get her dress from David’s Bridal because they were too typical. I did not feel the same way, I think David’s Bridal had some gorgeous dresses. However, after actually seeing the gowns at Celebrations Bridal, I thought they were on a different level. Plus, the atmosphere and aura inside of Celebrations Bridal made you feel like you were on that TLC show Say Yes to the Dress. Seriously! My sisters (Roselle and Rosalie) even attested to this. After I found my dream dress at Celebrations Bridal, I never followed through with an appointment at Alfred Angelo. My dress budget never really existed. I knew I didn’t want to spend more than $1000 for a dress, not including alterations, accessories, or shoes. What I did, though, was spend more than double that. I got the okay from the hubs to do so, which was a blessing. He said there was no point in spending all this money on photography and videography if I didn’t wear a wedding dress that was worthy of being photographed. I agree! In the end, I guess I could’ve spent less on a dress, but I was IN LOVE with my dress. It was sparkly, covered in lace, and made me feel like a million bucks! Here’s the dress in all its glory. Excuse me as I wipe my tears of joy. Here’s the back of the dress and the train. Here are more detailed photos of my wedding dress. I purchased the belt from Celebrations Bridal that eventually went on the dress. I felt like I wanted more bling and this was the perfect extra shiny piece on my dress. I like the belt because it made my waist seem more cinched in. I need all the help I can get y’all! Here are the two dress runner-ups that I had to say no to. It was so hard! 1) I didn’t select the ballgown because it made me feel like a little kid. What I did like about it was that it made me look way thinner. I think ballgowns do this for everyone. Wearing this type of dress would have been 100 times more comfortable at the reception too. I showed this to Prentyce (after the wedding was over) and he said he liked it as well. Knowing that, I should have purchased both. This dress was less than $1,000. 2) I liked this dress and its shape, but it didn’t have enough bling for me. The ruffles were so modern and stylish, but when I ended up showing this to my now-husband after our wedding, he said they looked tacky. Good thing I didn’t pick this dress! If you go to Celebrations Bridal, the person that helped me choose my dress was Hailey. She was so sweet and so helpful. She taught my sisters how to tie up the corset back of my dress. I think she’s so great at her job. I loved her upbeat attitude. I only had to go back for alterations twice, which I personally thought was not a lot. I had a really great alteration specialist (Cindy) who understood me and was good at her job. I had sleeves attached to my dress and they also had to make me a bustle, because my dress did have a thick train. The bustle was ginormous, but I think Cindy did an amazing job of making it work and teaching my matrons how to put it together. We did practice a few times! I suggest you do the same. These are some photos from my final fitting. This was exactly 10 days before the wedding! A special shoutout goes to my sisters and my mommy for helping me find the dress of my dreams! Thank you for your honesty, patience, love, and support. I could not have asked for better sisters! Thanks for reading friends. Don’t forget to read the related articles if you love wedding stuff just as much as I do! I also tried on a slew of dresses that I quickly said no to. Check out that blog article here. Photo credit to Cassidy Zellman Photography (our official wedding photographer) & my sisters and matrons of honor Rosalie and Roselle.